ERCE is a prospective, observational, multilingual, multicentre, online clinical register of patients with probable or confirmed Cystic Echinococcosis, born into the framework of the HERACLES collaborative project (Human cystic Echinococcosis ReseArch in CentraL and Eastern Societies). ERCE was originally conceived as a tool to capture the number and clinical characteristics of patients with CE reaching medical attention but not official statistics, with the aim to indicate that the burden of CE in Europe is higher than what is shown in official records. In 2016, the WHO Informal Working Group on Echinococcosis individuated in ERCE a possible starting platform for the collection of clinical data to be used to drive evidence on treatment recommendations from case series of patients in the absence of prospective randomized clinical trials, which are extremely difficult to conduct in CE and as such virtually absent. With this commitment, a new amended version of ERCE is currently underway to make it fit for this ambitious task. - fostering biological, epidemiological and clinical research on CE. ERCE is a database organized in sheets. For each patient, data on the clinical history of the disease (first diagnosis, cyst number and localization, WHO-IWGE cyst classification, symptoms, surgical interventions, other therapies, etc.) are recorded. •	Rossi P, Tamarozzi F, Galati F, Pozio E, Akhan O, Cretu CM, Vutova K, Siles-Lucas M, Brunetti E, Casulli A; HERACLES extended network. The first meeting of the European Register of Cystic Echinococcosis (ERCE). Parasit Vectors. 2016 Apr 28;9:243. doi: 10.1186/s13071-016-1532-3. • Meeting of the WHO Informal Working Group on Echinococcosis (WHO-IWGE). WHO Headquarters, Geneva, Switzerland 15–16 December 2016. •	Specialized Hospital for Active Treatment of Infectious and Parasitic Diseases “Prof. I. Kirov”, Medical University, Sofia. •	San Matteo Hospital Foundation, University of Pavia, WHO Collaborating Centre for Clinical Management of Cystic Echinococcosis, Pavia. •	Spitalul Clinic Colentina Bucuresti, University of Medicine and Pharmacy, Carol Davila, Bucharest. •	Hacettepe Universitesi, School of Medicine, Department of Radiology, Ankara. •	Control of Infectious Diseases Department, Institute of Public Health, Tirana. •	Department of Medicine I, Div. of Infectious Diseases and Tropical Medicine, Medical University of Vienna, Vienna. •	Department of Hepatology, Sir Salimullah Medical College, Mitford Hospital, Dhaka. •	Multi-Profile Hospital for Active Treatment “Kardzhali", Gastroenterology Ward, Kardzhali. •	Centre Hospitalier Régional Universitaire (CHRU) de Besançon, Laboratoire de Parasitologie-Mycologie – PCBio, Hôpital Jean-Minjoz, Besançon. •	S. Virsaladze Research Institute of Medical Parasitology and Tropical Medicine, Tbilisi. •	Egyesített Szent István és Szent László Hospital, Budapest. •	Department of Parasitology, School of Medicine, Kerman University of Medical Sciences, Kerman. •	Unit of Infectious Diseases, Department of Medical and Surgical Sciences, University “Magna Graecia”, A.O.U. “Mater Domini”, Catanzaro. •	Infectious Diseases Unit, S. Maria Nuova Hospital - IRCCS, Reggio Emilia. •	Unit of Infectious Diseases, University La Sapienza - Faculty of Medicine and Psychology - S. Andrea Hospital, Rome. •	Operational Unit of Translational Medicine, Laboratory del Vecchio, I.N.M.I. "L. Spallanzani" IRCCS, Rome. •	Unit of Infectious and Tropical Diseases, Center for Travel Medicine, ASL TO2 - Amedeo di Savoia Hospital, Torino. •	Department of Special Diagnostics for Diffusive Pathologies, Department of Laboratory Diagnostics, Institute of Hygiene, Palermo. •	Department of Infectious and Tropical Diseases - Careggi University Hospital, Firenze. •	Unit of Infectious and Tropical Diseases, Veneto ULSS 6, Vicenza. •	Infectious Diseases Department, Niguarda Cà Granda Hospital, Milano. •	Institute of Maritime and Tropical Diseases, Gdynia. •	Unit of Infectious and Tropical Diseases, CAUSA – IBSAL – CIETUS, Salamanca. 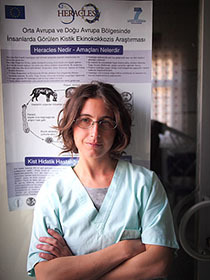 Patrizia Rossi, WHO Collaborating Centre for the Epidemiology, Detection and Control of Cystic and Alveolar Echinococcosis; European Union Reference Laboratory for Parasites; Department of Infectious Diseases. Istituto Superiore di Sanità (Italian National Health Institute), Rome. Francesca Tamarozzi, Centre for Tropical Diseases sacro Cuore Don calabria Hospital, Negrar, Verona, Italy; WHO Collaborating Centre for the Epidemiology, Detection and Control of Cystic and Alveolar Echinococcosis (in humans and animals), Rome, Italy; WHO Collaborating Centre for Clinical Management of Cystic Echinococcosis, Pavia, Italy. Enrico Brunetti, San Matteo Hospital Foundation, University of Pavia, WHO Collaborating Centre for Clinical Management of Cystic Echinococcosis, Pavia. Fabio Galati, DG-INF, Information Technology Service, Istituto Superiore di Sanità (Italian National Health Service), Rome, Italy.